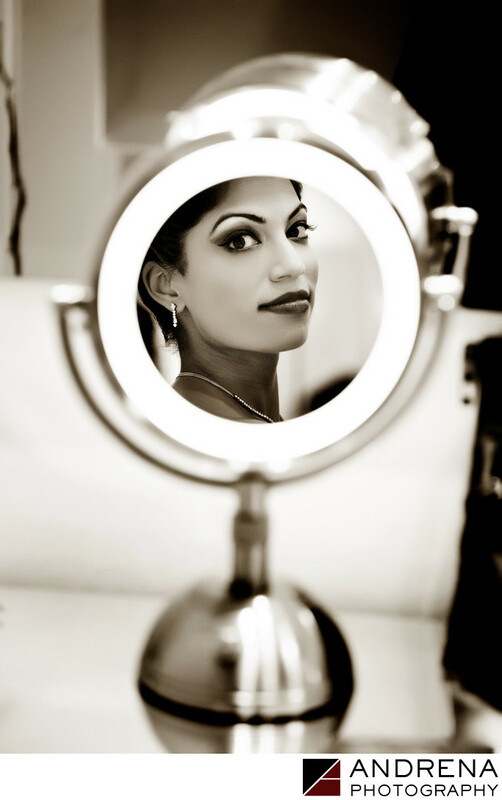 I love when I can capture a bride or groom's reflection in a mirror, as was the case at this Indian wedding at the Ritz-Carlton Laguna Niguel. This bride actually had two ceremonies, with the Catholic ceremony taking place at a Catholic church and the Hindu ceremony taking place at the Ritz-Carlton. This image was taken during her first clothing change, when she was just having her makeup finished, before she put on her white wedding dress and bridal veil. I loved that this mirror had an illuminated circle, as it provided a lovely frame for the bride's face. Indian and Catholic fusion wedding photographed at the Ritz-Carlton in Dana Point, California.